"The Island of Iona owes its celebrity to Saint Columba, a native of Ireland, who took up his abode in the year 568 as a Christian preacher. It lies about nine miles south-west of Staffa, and is separated from Mull by the Sound of Iona. One of the smallest of the British isles, situated near a rugged and barren coast, surrounded by dangerous seas, and possession no sources of internal wealth, it has obtained an imperishable place in history as the seat of civilization and religion, at a time when the darkness of heathenism hung over almost the whole of northern Europe, and as the source whence these buildings were so widely diffused in countries whose inhabitants have ever since been in the foremost ranks of the human race. The island is almost three miles in length, and one-and-a-half in breadth. To visitors, advancing from the east, it presents the appearance of a plain, slightly elevated above the water, and which, as it recedes from the shore, is broken by numerous rocky hillocks of irregular shapes. The highest, Dun Ii, reaches the elevation of about 400 feet above the level of the sea. 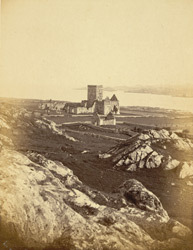 The name Iona is Gaelic, and signifies Holy Island, but its original name was Innis-nan Druidneach, or Isle of the Druids, from its being occupied, previous to the introduction of Christianity, as the seat of a Druidical college."